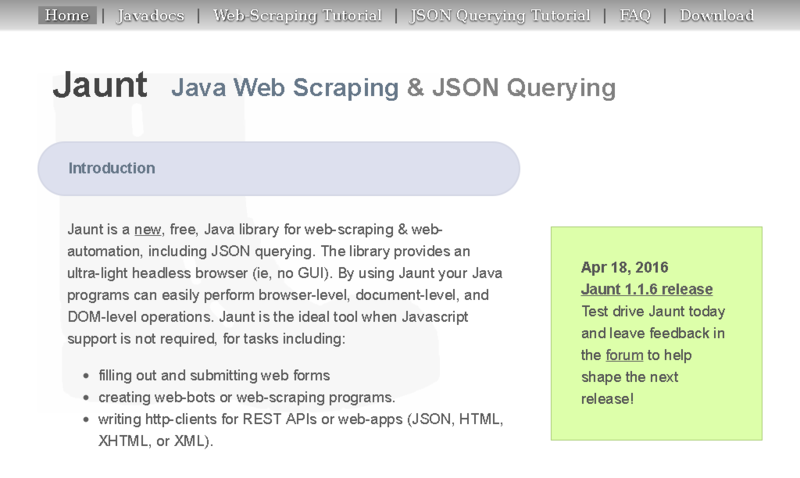 I recently found out that there is a new player in the game of web scraping with Java. It is called Jaunt and developed by Tom Cervenka. I worked a lot with Jsoup and the question arised what the difference compared to Jaunt is. There was no article on the web that satisfied me so I decided to write my own. I also emailed with Tom so that I can provide correct information here and don’t miss something important. Let’s start with a very important point for most developers: licensing and pricing. From the website it states that Jaunt is a free Java library. This is only the partial truth. As Jaunt is a commercial library it provides multiple versions – paid and a free for a monthly download. The free version can be used for personal or commercial projects, including redistributing the jar file, sublicensing, etc. In terms of the restrictions it places on the code itself, it is actually more liberal than the MIT license used by Jsoup, which dictates that a developer’s code must include the MIT copyright/permission notice in all copies or substantial portions of the software. The non-free, two-year version of Jaunt, on the other hand, is far more restrictive than the MIT license, since it does NOT allow redistribution of the jar file. That makes it well suited for server-side projects and/or any personal project that is not distributed. The enterprise version is a business license (generally covering an unlimited number of employees) who’s terms are completely negotiable, so it may or may not allow redistribution, depending on the needs of the client. If you download and use the free version it expires at the end of each month. So that means you have to download a new free version every month, include the new jar-file in your project (replacing the old one), recompile and redeploy it. If this is too much work or just not possible you have to pay for it. I am using Jaunt api and my software stop working and it says „JAUNT HAS EXPIRED! [http://jaunt-api.com]“. Jsoup is an Open Source project developed by Jonathan Hedley available under the MIT license. This allows you to use it in any project (personal and commercial) free of charge. You can also look at the source code on Github. Now let’s come to the main part of this article. Here we cover the differences of both libraries as well as some unique features. Jaunt does not to support CSS selectors or XPath because I consider the Jaunt querying syntax more readable. The user doesn’t have to think about CSS selectors, then maybe XPath, and then something else for querying JSON. With Jaunt, the query looks like the thing you’re trying to find, so there’s very little cognitive load when building or reading a query. Jsoup is available through Maven Central. Jaunt on the other hand is not due to the expiring license. To use Jaunt with Maven you have to download and install it to your local repository. We look at a simple code example that prints the urls of the top 10 Google search results to the console. The search term we use is apple. This simple example is not enough to cover all the differences but it gives you a hint and that it what it’s meant to do. In general Jaunt seems to work on a higher level of abstraction than Jsoup. It also provides some neat features out of the box (like caching, web pagination discovery, …). 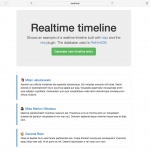 In addition to the HTML features Jaunt has integrated working with REST APIs and JSON. So now you can build your own opinion which route you want to go. I listed all the facts above. If I forgot something important don’t hesitate to write me. Personally I stick with Jsoup for HTML processing and use Unirest for working with RESTful APIs and JSON. They both together provide nearly all features from Jaunt. If I need a Cache I build one either with Google Guava or use a full grown solution like memcached or redis. Also I like CSS selector syntax much more than the custom syntax of Jaunt. If you liked this article please share it with your friends and give me some comments below. All you have to do is to click on the course image above. The discount code is included in the link!